Supercharged continuation Cobra and Series I coming up for auction next month. left his mark on a lot of vehicles over the course of his long career, but only a handful were truly his own unique creations. And there's a matching pair of 'em coming up for auction. Set to come under the hammer at RM Sotheby's sale in Fort Lauderdale late next month are a and , both decked out in the same combination of silver with deep red racing stripes and black interiors. They're said to come from the same (although unidentified) private collection in Texas – the great state that Carroll called home. The Cobra is a model that should require no introduction. Based on a vehicle originally developed in the UK by AC Cars, Shelby made it his own by swapping out the smaller engine in favor of a big old American V8 – most notably Ford's 427-cubic-inch (7.0-liter) big-block. This isn't an original, but an officially sanctioned "continuation car” – essentially a replica of the cars Shelby made in the 1960s, but officially licensed by his company. This appears to be the last of the 50th anniversary models, all 50 of which sold out within 48 hours in 2014, complete with a Vortech supercharger for added oomph. Lesser known is the Series 1. 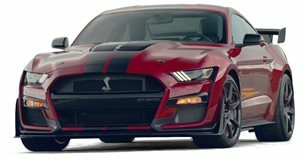 Shelby's only clean-sheet design, the Series I packed a 4.0-liter V8 sourced from Oldsmobile, kicking out 320 horsepower to sent it to 60 in 4.4 seconds. This would appear to be one of the original 249 that were built as turn-key vehicles before subsequent examples were sold as kit-cars after federal certification expired. And if our eyes don't deceive us, we appear to be looking at one of just 60 equipped with the optional supercharger, giving it 450 hp for a 3.2-second 0-60 time. That could make it rather valuable, especially when paired with the matching 2006 Cobra.